Set different levels of sub-admin rights in a Magento store. Restrict access by Website, Store, Store View or category. 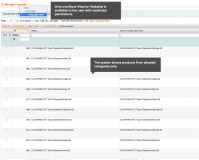 Control what sub-admins do by restricting product editing and setting approvals. Let marketers create one-off specials or set seasonal prices. 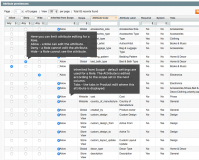 Provide access to Reports and other data ensuring employees don't tamper with vital Magento settings, and much more. With multiple employee roles and responsibilities, it is a challenging task to ensure everyone has the required level of access to the software systems in place. Thanks to the extension, Magento store owners can set up a multi-level access framework where employees have specific access rights based on their roles and functions. Ensuring only authorized users have the right to access the admin panel is the number one task for online retailers. The module provides an ability to create a robust access management system at Magento stores, enhancing the access security and so protecting mission-critical data from any external interception. Ecommerce data should be accurate and consistent in order to ensure timely and unmistakable order execution. By assigning different access rights in the admin panel, admins prevent authorized users from viewing the data they don’t need and so eliminate the risk of its accidental damage or loss. Restrict access at Website or Store View level. Restrict editing of products or product categories. Limit the management of Orders. Restrict access to Newsletter subscribers. 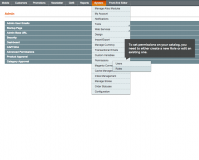 Restrict access to/management of these CMS elements: Pages, Static blocks, Widgets and Polls. Limit access to Promotions (restriction set on the website level). 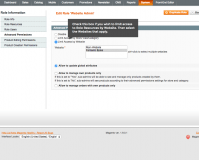 Restrict Customers management (restriction set on the website level). Restrict access to these Reports: Sales, Abandoned Carts, Products, Customers, Reviews and Tags (restriction set on the website level). Disable creation of specific product types. Approve products and categories created by sub-admins before they go live. Disable certain product tabs for a sub-admin. 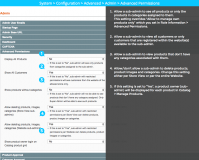 Specify which product attributes are available to a sub-admin. New! Hide the attributes not available to a sub-admin, if you want. Allow / don't allow a sub-admin to edit global attributes for products available to the sub-admin. Allow a sub-admin to edit only the products they created. Allow a sub-admin to edit only Orders that contain their products. Prevent a sub-admin from viewing products by others. This extension is also available for Magento 2. 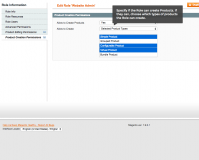 Magento Multiple Inventory Locations module - Control all your inventory from a single dashboard. 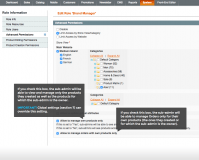 Stock Management extension for Magento - Add as many warehouses as needed, manage their settings, and receive automated notifications for the products running out. Magento Abandoned Cart emails extension - Monitor the visitors who haven’t completed an order and bring them back with targeted emails. Magento Performance Optimization plugin. - Enable faster page rendering by compressing Java Script on your website. * Fixed an issue with rewrites files' contents generated by the extension. * 'Show All Customers' setting is is now set to 'No' by default. + Added an option to hide product attributes for a sub-admin on a product edit. * Fixed issues with a product status reset when updating a product via mass-action on product grid or individually. * Fixed "access denied" issue when sub-admin with restricted resources can't be duplicate a role. * Fixed the permission issue with editing product status via product grid mass-action by a sub-admin. * Fixed the error when creating shopping cart price rule on Magento CE 1.4.1. + Extension interface texts are corrected. * An issue when sub-admin is able to see restricted orders through RSS feed is fixed. * Fixed the issue with viewing orders by subadmin when there is a prefix in magento DB. * Compatibility fix with AITOC Individual Promotions extension (sql-error when clicking on customer groups filter is fixed). * Fixed the issue with direct link available to sub-admin for editing the restricted product. * Fixed the issue with limiting access to create product using button 'duplicate' although creating products is disabled. * Fixed the issue with limiting access to group price and tier price attributes. * Fixed the 404 error when Advanced Permissions and Multi-Location Inventory are enabled together. 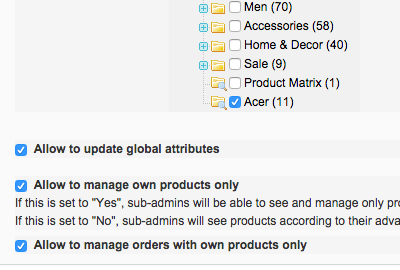 + Enables super-admin to allow sub-admin users to manage only those orders that contain their own products. * Fixed the issue with displaying CMS pages for restricted admin. * Fixed the issue with order not available for sub-admin if "Show All Customers" is set to No and order is placed by "NOT LOGGED IN" customer. + Super Admin can allow/deny specific product type(s) creation for a role. * Fixed the issue with promotion labels for a restricted admin. * Fixed the issue with 'product owner' field for restricted admin. * Fixed the issue with inventory tab when creating product by sub-admin user. * Fixed the issue with creating product by restricted admin. * Fixed the issue with product attributes and store view scope. * Fixed the compatibility issue with Multi-Location Inventory (ver. 2.1.12+). * Fixed the compatibility issue with Multi-Location Inventory. * Fixed the issue with store view admin permission that allowed to change the option limited to website. * Fixed the issue with mass delete products action. 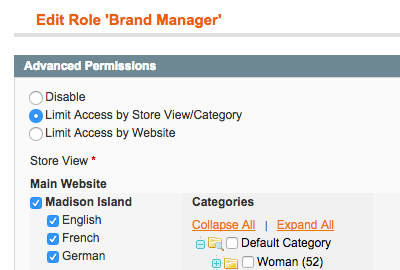 + NEW Feature - Admin can now limit access for a Role to website on Promotions. * One Store View and admin restricted by website issue is fixed. * Fixed the issue with user role can not be determined when saving a product via api. * Fixed the error when database tables have a prefix. * Fixed bug with inability to create category by sub-admin. * Fixed bug with inability to edit product when certain settings are combined. * Fixed bug with incorrect validation in Role settings. * Fixed bug with incorrect display of reports in Reports->Shopping Cart->Products according to Roles settings. + Added ability to restrict access to Newsletter Subscribers section by stores, store-views and websites. * Fixed fatal error with session cookie. * Fixed bug inability to create bundle product by sub-admin with "allow update global attributes" setting off. * Fixed bug with SQL error when creating simple products for configurable product. * Fixed bug with ability to edit SKU and Weight by sub-admin restricted to edit Global attributes. * Fixed bug with inability to add product to an order; * Compatible with Magento 1.7.0.1. * Fixed bug with error when managing CMS. * Fixed bug with ability to save a new product by sub-admin with not filling mandatory fields, when "update global attributes" setting is off. * Fixed bug with fatal error when accessing categories with limited admin. + Added feature "Duplicate Role"
* Fixed bug with saving Role's access to categories with more than 3rd embedding. * Fixed possibility to update global attributes via bulk attribute update, when the "Allow to update global attributes" setting is off. * Fixed incorrect displaying of Advanced Permissions tab in IE9. + Added new feature "Notification of Super-Admin about new products". * Fixed bug with products not displaying in Manage Categories. * Fixed the bug with saving a restricted attribute. * Fixed the bug with creating simple products for configurables. * Fixed the bug with absence of Delete option in Mass actions drop-down in Product grid. * Clients having another our extensions running may experience an error upon opening Sales > Orders page. Fixed. + Added new setting "Allow editing global attributes for products" for restricted admins. * Fixed minor bug with static block in Categories section. * Fixed issue with Advanced Permissions settings for role becoming disabled after role resaving. (bug appeared again in 2.2.6). * Fixed issue with not being able to save role preferences. * Fixed issue with Advanced Permissions settings for role becoming disabled after role resaving. * Fixed incorrect displaying of products when filtered by Store-view in 'Choose Store View' drop-down. * Fixed incorrect creating of products when restricted user had access to non-default store of a website. * Not correct operation of Choose store view drop-down. 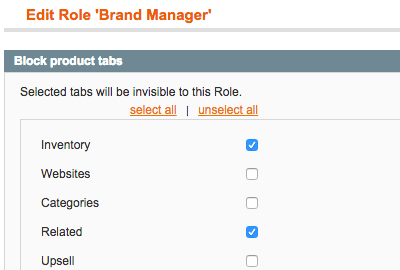 + Added ability to restrict access for a Role to several store-views or websites. * Fixed bug with "Show all customers" setting. + Info on the dashboard is displayed in accordance with user’s roles and permissions. categories editing per store view. I've decided in favor of your extension though I considered the same module by Amasty. The functionality is virtually the same, but the support service is absolutely free. Easy to install and does exactly what it is supposed to do. Great and quick support. At the first, I wasn't really happy with this extension because I couldn't make it work, but it came up that other module (InnoWarehouse) is making problems. Professional guys from their support quickly resolved the issue and also helped me with several queries I had regarding the usage of their product. Advanced Permissions does exactly what I expected and needed. I'm managing the 13 separate websites from the single Magento installation. I needed the plugin that will give me the full control over permissions and block other admins to view orders, customers and other information from the stores that they don't manage. This extension does that and it does it really good and easy. Works perfectly. Simply to install and to configure. This module saved me a lot of time and my customer was totally satisfied. Must-have for those who has more than 3 staffs. We have 15 managers working on our site daily. The percentage of the errors when managers updated wrong orders was dramatically high. Then we decided to invest in this solution to separate the access. The situation was improved within a week. Thanks to Sergei for a phone call during which he studied us how to configure and use this extension for our purposes. Great job and excellent support. One of the very best and useful extension that I bought so far. With this extension, you can easily setup a multi-vendor website, where you can set different roles, different product management and editing capabilities, and a whole lot of things that you can imagine. This is one powerful extension with top-notch support. I reported a few bugs that I found in the extension, and the Aitoc team immediately fixed those subtle bugs. Rest assured that this extension will work without problems after you install it. Just tried it in old versions, but I recommend that you'll upgrade your Magento version to 1.9.2.2. Good trusted extension. Fast and professional support. They solved my problems within 10 hours. Quite nice results for magento vendor. I think this is the best extension out there. My customer is completely happy now. I purchased this extension to limit access for the staff in the back-end. My client has 40 staff working on different task every day. It was a nightmare to track so that they won't do anything with things they should not touch. This solution made my day. I had a small conflict with other extension but the support fixed it within 1 hour. Recommend!!! Greeting from Denmark. Managing who? does what? when? at what admin level? is important. It is also very important all desired extensions work together. Aitoc has a wide range of extensions, and after reading review's, especially reading about their fast and accurate support, I feld Aitoc was my way to go, and so glad I did! My ordered Advanced Permissions and front-end-editor, - with installation-, My support request was replied within 2 hours, and both extensions got installed within a day (actually: friday afternoon), so I could work during the weekend experimenting with correct admin and editing settings. Works with other extension I and already bought. Magento root-Admins can not afford not to buy Aitoc's Advanced permissions, it is a plain simple must have. It does what it says.Excellent support. Wow , I never thought they will provide that deep support. I have extension Extended Orders it had conflict with Aitoc Advance permissions .My developers tried to fix it but it was taking extra time . Aitoc support responded immediately to my email and assigned a developer to look into issue , he fixed it and copied a support folder with modified files and original files , how thoughtful. Definitely recommended. We use a single Magento installation to support 3 different stores. This extension provides us with the functionality we need to have separate user/admin accounts for each of the stores and limit access to different catalogs. If you run multiple stores, you need this extension! We bought this module originally in 2011. We have 8 stores with about 35 users all managing products, orders and some content independently with different roles and permissions. Each user only sees their store views and products so there is no confusion and/or mistakes. This module works perfectly for our situation and I can't recommend it enough to anybody in the same situation. We rarely even remember what module offers all these features because we set it up 4 years ago and across module upgrades, changing users and many Magento upgrades it has just worked seamlessly for us. Thank you for a great product and saving me at least dozens of support hours! I Recommend Aitoc Advanced Permissions. for its support and its functionality. It works fine as per the description. We recently bought advanced permissions extension as we were hosting multiple stores through a single magento install and needed to restrict the access levels of some users. this extension enabled us to have the new admin users have store specific visibility and access. since the extension is very detailed, it can take some effort setting it up. support is courtious and answers queries quickly. recommended for those in need of more user permissions control than being offered in stock magento. Very good extension. Works perfectly with multistore magento sites. Thanks a lot! I've had this module in a project with Magento 1.7 and it worked very well. Now in new need, I used the latest release of the module in Magento 1.9.0.1 and again, it worked perfectly. 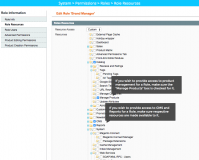 I have a multi domain installation in which I needed manager to be able to see only their domain resources. With this plugin I solved all my problem. Easy to install and setup with all options I needed. I installed it and it worked out of the box (magento 1.9), just had to follow the instructions. I found a problem when using it and submitted a ticket but turns out it was expected behaviour of roles and permissions so it was more of a design error of magento. Support was quick and good though. It's a very useful feature that anyone with a multi-store environment should consider, and on top of that it's dead easy to install and use. GREAT EXTENSION Highly effective support. Must Have. Great extension ever we purchased at Magentocommerce, especially perfect choice for our B2B2C business model, with this extension we can easily allow our customers log into Magento admin and work like a Marketplace! High Recommended! My complex multi-website project needed the Aitoc Advanced Permissions module to get the job done. AITOC's support team works is able to identify the complex issues to get fulfill my needs. Thank you for your hardwork! This extension is critical to our multi-store implementation. We need it. It just works. Excellent support. Absolutely worth its money. The extension does what it promises and runs smoothly on our multi-website and store project. Moreover, the developers are hearing you. They respond quickly to your questions. Keep up the good work! 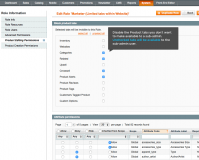 A great and powerful Magento extension. Absolutely worth its money. The extension does what it promises and runs smoothly on our multi-website and store project. I can confirm the quick support other customers have already mentioned. Keep up the good work! Firstly this extension installed without any issues. If you want to give access to someone who could in any way damage your site or settings, or maybe is a freelancer or translator, this is the extension to have. I wanted to have our listings translated into 4 key EU languages, Spanish, French, German and Dutch. With this extension I have given the Spanish translator access to only: Spanish store view Products I have assigned to a Translation/Spanish category They cannot see any other part of Magento, no sales history, no customers and they have no way of deleting an item. All they can do is update the product in the Spanish view area and then re-assign it's category once done. A fantastic bit of software and a must if you want to restrict staff in any way. Well done guys n girls! YES !!! GREAT EXTENSION GREAT SUPPORT ( highly effective people ) A MUST HAVE ! This extension is really good. I would love to recommend to buy. It is very easy to install. In addition, support is very helpful. Excellent extention! Absolutely necessary for those who have to manage multiple stores. We have 2 stores managed by people at very distant locations and this tool makes it easy to do the job. I couldn't beleave this was not already included in the base package, since the option Multistore is there. Never had to use the support. Very easy and intuitive to configure. Very useful for multisite e-commerce and does what it says. Support very fast. 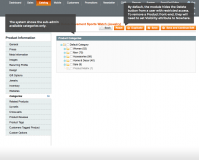 This plugin has provided us to simplify our catalog maintenance. Allowing us to build in safe guards so that products cannot be edited across different business units. Great customer support provided throughout the sales and installation stages. Cannot recommend highly enough. We were developing 3 separate stores to be run off of one internal system, and this module provided all the features we needed. Allowing ourselves as administrators to restrict user access to the other stores really simplified the whole process and saved us an abundance of time it would have cost to set up 3 different databases over 3 different installations. Would highly recommend to anyone who was at the point of expanding their network, but still wanted everything kept under one roof. We were developing 3 separate stores to be run off of one internal system, and this extension provided all the features we needed. Allowing ourselves as administrators to restrict user access to the other stores really simplified the whole process and saved us an abundance of time it would have cost to set up 3 different databases over 3 different installations. Would highly recommend to anyone who was at the point of expanding their network, but still wanted everything kept under one roof. This extension is very good. Just install it and everything works. The center support is very fast and helpful. This extension is really excellent and the center support is very fast in the responses. I recommend it to everyone this extension. 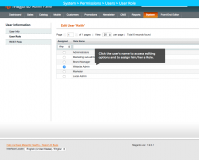 This extension will help tailor an administrator account to suit your needs. Everything functioned well except for two small glitches - one was discovered after installation and another a few weeks later. The developer support can be expensive, but it's amazing how much a polite (and honest) review is worth :) BTW - the actual cost of this extension is $199 at the time of writing (not $149 as shown here). Fulfills the promised BUT, generate very slowly to the server. Every page generated by site users pass 1 second for at least 3 seconds to wait to receive it. The reason is simple: Every time a page is generated to query an external server, which stops execution of the script until you get some response. 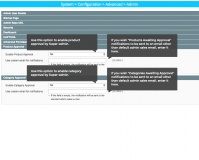 This is the authentication system plugin with validation of purchase. Every time is too much! Advanced Permissions made our latest Magento multi-website project possible. It's a great module! AITOC's support team works fast and helps with any problems. Thank you so much for your work! I have bought the Advanced Permissions module, and it works as per their demo site. 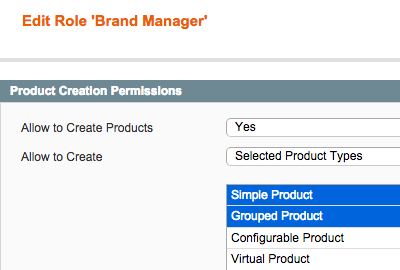 As can be shown in the video, it is very useful to restrict subadmin rights in the Catalog->Manage Products tab. However it is a pity that the subadmin rights are not restricted in the System->Import/Export tab. Which means that the admin cannot allow the subadmins to use this function, and all subadmins products have to be entered/edited one by one via Catalog->Manage Products tab. So IMO the use of this module is limited to small subadmins catalogs. Great Plugin, great support! thank you! Works really fine and the Support is great! Reaction Time is often less than 30 minutes. Great! This extension just rocks, fast answer from support for test mode and works at first time, real great if you have a partner for your others languages. Thanks ! I am very impressed with Aitoc's fantastic support. It's really great module and there is no doubt that it is the best option for multi-website project! Absolutely 5 Stars! The product does exactly what it says on the tin and when I had a problem (conflict with a delete orders extension) they fixed it for me the same day. Great service, thank you. We purchased this extension to use on an expansive multiple storefront project and I was blown away with how simple to use and powerful this extension is! We only had a single problem that was resolved by AITOC's AMAZING support team within 24 hours of submitting a support ticket. These guys are number one in the extension game and I would tell anyone that is looking for an extension to use these guys. THANK YOU! Excellent product. The product does exactly what it says on the tin and when I had a problem (conflict with a delete orders extension) they fixed it for me the same day. Great service, thank you. Nice Module.. but how can we do order management? There is no step given in the user manual for order management. AITOC: Order management restriction can be set the same way Catalog restriction is set in the User Guide. You just need to check Order section in Role Resources. It's a very good extension. We had some display problems that were resolved within a few hours, then the support is excellent. And an excellent provider. support nice, friendly, fast service and solved the problem Thanks! Superb module .............great help with multistore magento sites. Works great, very fast and good support! 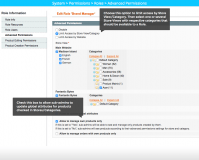 Advanced Permissions is a flexible and powerful module. Exactly what we needed. AITOC's support has been magnificent. They are very responsive, efficient and quick to resolve. Thanks! Hi to all, I found this extenstion very very very useful, If you can provide the order-mangement in demo then it would be much better.